Salt saves you time by shopping around for your home and auto insurance quotes. We'll send the best quote straight to your inbox. We have the know-how when it comes to comparing insurance quotes from top providers. Salt can help you save time and money on your home and auto coverage. 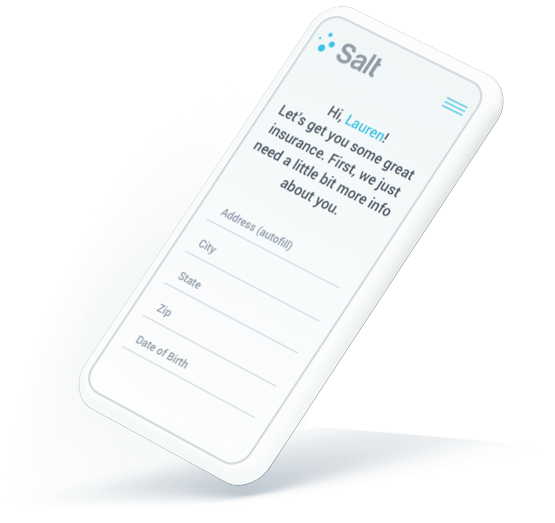 Why Shop Salt for Personalized Insurance? Tailored. Efficient. Done. Salt is the best way to get an insurance quote online. We'll shop around multiple carriers to get you custom home and auto insurance quotes that suit your unique needs. Let's face it, we're all a little salty about our current insurance company, so let us shop around for your quotes. We'll get you the best coverage at the best rate in Texas without wasting your time. The old way to buy insurance is over. Pay for the coverage you want, the way you want it. Tell us a little about your home and auto insurance needs and we'll match you with a quote you can't resist. Tired of putting in a ton of effort shopping for insurance only to have to do it again in a year? 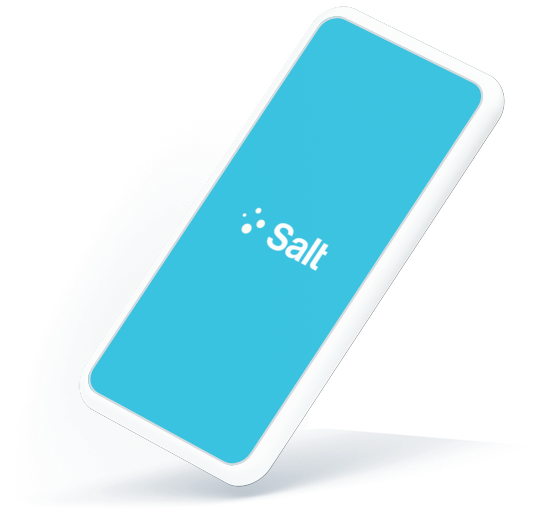 Salt has you covered. Every year, we'll get you the best insurance rates in Texas... like clockwork! Just answer a few questions using our insurance comparison tool. We'll carefully look at your options and find you home and auto insurance that will have you living your best life in no time. What's important to you? We'll get you the perfect insurance quote. Forget the old ways of doing insurance, Salt is simple, efficient and truly Texan. You don't need to meet with or call a bunch of agents to get the best insurance quote in Texas. Let Salt do the heavy lifting. Salt won't call you or spam you like other companies do. We'll email you only the best home and auto insurance quotes, straight to your inbox, so you can review it on your terms. You only have to put a ring on it once. Salt helps you clearly understand, customize and buy quality home and auto insurance. We shop around every year to ensure you're always paying the best price for the coverage you need. Got Questions for Salt? We've Got Answers. Salt's here to help you find the best insurance quotes in Texas. So, let's clear the air. How does Salt use my info? The info you provide Salt allows our insurance companies to determine the right amount of premium for the amount of risk that is being transferred to them. The purpose of insurance is to offer a way to exchange premium (your money) for a guarantee of compensation (insurance company’s money) given a future loss (claim). Your info is not given to any third parties. Salt Insure is an appointed representative of the insurance companies and your info is only shared as a part of that agreement and underwriting process. You can rest assured that your information is kept private and only used for underwriting purposes. Thank you for trusting us with your personal information. We will take good care of it and it is safe with us. What's the kicker, does Salt make money? As an appointed representative of some of the best insurance companies, we are under contract to perform the sales function of their operation. Rather than hire thousands of salespeople to distribute their product, the insurance company utilizes independent agents like Salt to reach you, the consumer. As a part of that agreement, the insurance companies pay Salt commission for what we sell. The commission is an agreed-on percentage of the premiums that you pay to the insurance company. You will owe Salt nothing, whether you decide to stick with us or not. Will my insurance policy be with Salt? Let’s define the relationship! Salt is the agent or “middleman” as some like to call it. Our job in the relationship is to place your policy or home and auto coverage with one of several insurance companies that we represent. Their job in the relationship is to pay you (make you whole) should you experience a covered loss. Do I have an agent? Salt. Our job is to offer counsel about home and auto coverage options, provide access to the best insurance companies for competitive quotes now and at renewal, and to meet your service needs during the life of the policy. Who do I call if I change my mind about something? Salt. We have several ways for you to let us know if you need help. You can use the Live Chat function on our site as well as call our toll free number. We work with home and auto insurance companies that are revolutionizing the way insurance coverage should be.